The flag of Togo was adopted on 4/27, 1960 when the country gained independence from the republic of France. The flag features the pan-African colors of yellow, red, green, which have been used and adopted by many ex-colony countries as well. These colors are thought to have come from the flag of Ethiopia, which is the oldest independent nation in Africa. The flag of Togo is made of five equal width horizontal stripes. The bottom, top, and middle horizontal stripes are green and the other two are colored yellow. In the top right corner, there is a five-point star centered on a red square. The red square stands for patriotism and loyalty towards their country. The color green represents agriculture, fertility, and hope. The five stripes represent the nations five geographical regions. 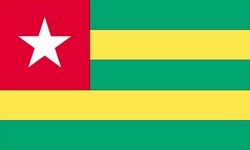 The white star represents purity, peace, dignity and life as well as Togo’s independence. An interesting fact about the flag is that a man named Mr. Ahyi Paul, a student in France, came up with the design. He entered his design in a competition back in the year 1958.